Objective To evaluate the cost effectiveness of a multidisciplinary team including a pharmacist for systematic medication review and reconciliation from admission to discharge at hospital among elderly patients (the Lund Integrated Medicines Management (LIMM)) in order to reduce drug-related readmissions and outpatient visits. 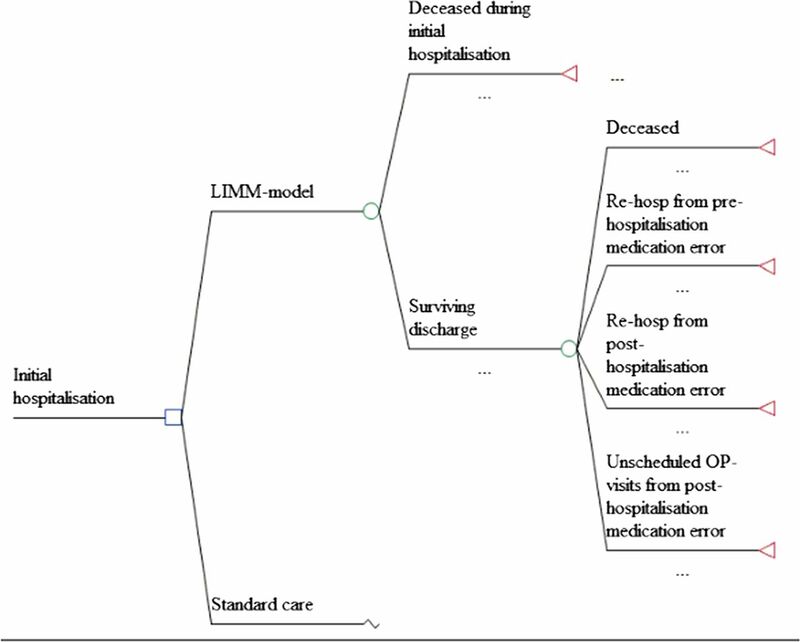 Method Published data from the LIMM project group were used to design a probabilistic decision tree model for evaluating tools for (1) a systematic medication reconciliation and review process at initial hospital admission and during stay (admission part) and (2) a medication report for patients discharged from hospital to primary care (discharge part). The comparator was standard care. Inpatient, outpatient and staff time costs (Euros, 2009) were calculated during a 3-month period. Dis-utilities for hospital readmissions and outpatient visits due to medication errors were taken from the literature. Results The total cost for the LIMM model was €290 compared to €630 for standard care, in spite of a €39 intervention cost. The main cost offset arose from avoided drug-related readmissions in the Admission part (€262) whereas only €66 was offset in the Discharge part as a result of fewer outpatient visits and correction time. The reduced disutility was estimated to 0.005 quality-adjusted life-years (QALY), indicating that LIMM was a dominant alternative. The probability that the intervention would be cost-effective at a zero willingness to pay for a gained QALY compared to standard care was estimated to 98%. Conclusions The LIMM medication reconciliation (at admission and discharge) and medication review was both cost-saving and generated greater utility compared to standard care, foremost owing to avoided drug-related hospital readmissions. When implementing such a review process with a multidisciplinary team, it may be important to consider a learning curve in order to capture the full advantage. The LIMM model involves systematic patient centred and team-based activities and structured tools for medication review, including medication reconciliation. The model has been extensively investigated and shown important improvements in the care process and on some patient outcomes. This study investigated the cost utility of the model based on data from three LIMM studies. The study was shown to generate both cost savings and higher utility to the patients. Investing €39 in clinical pharmacist time could save €340 in medical care at hospital and in primary care, as well as in administrative costs for correcting errors in medication lists in primary and municipality care after discharge. All bias and confounders could not be ruled out since not all included studies were not randomised and controlled. Utilities were taken from the literature and may not entirely reflect the analysed patient population. Cost savings were shown to be stable also in several sensitivity analyses which indicated that these shortcomings may be of less importance. The aim of this study was to develop a health economic model to study the cost-utility of the LIMM model, that is, taking into account the health-related quality of life aspects. With such an analytical tool, it would be possible to determine how much the different activities contribute to costs and effects. Schematic description of the decision tree evaluating the cost effectiveness of the Lund Integrated Medicines Management model versus standard care. In a study by Hellström et al,6 a systematic medication reconciliation and review process at initial hospital admission and discharge was evaluated (among 109 patients) compared with standard care with medication reconciliation upon discharge (101 patients). Nine and 12patients, respectively, deceased before hospital discharge. Of those surviving discharge, hospital re-admissions with a ‘certain’, ‘probable’ or ‘possible’ causality assessment, occurred in 12 and 6 patients, respectively (absolute risk reduction=6.9%) during the 3-month follow-up. Midlöv et al25 studied the difference in need for medical care due to medication error among patients with and without a medication report at discharge from hospital to a nursing home or their own home with nurse assistance for drug dispensing. Using the same WHO criteria as described above, they found that 11 of 248 prospective patients (4.4%) in the intervention arm (I) experienced a medical care event due to medication error with certain, probable or possible causality. This was compared to 16 out of 179 patients (8.9%) in the control arm (C) recruited retrospectively from the same departments, an absolute risk reduction of 4.5% (p=0.049). A further analysis of the data revealed that these medical care events were either outpatient contacts (I:10; C:13) or hospitalisations (I:1; C:3), none of them statistically significant (table 1). The split between unscheduled outpatient visits (42%) and telephone contacts (58%) due to medication errors were taken from observational data among 100 random patients aged 54 and above from March 2006 to November 2006 (Lina Hellström; data on file). In addition, we assumed that a telephone contact and a visit would consume 15 and 30 min, respectively, in physician time including medical chart updating (Patrik Midlöv, personal communication). The probability of a medication error with and without the intervention has been estimated to 32% and 66%, respectively.21 However, in order not to double count the cases which had to seek medical care due to medication error, we subtracted these events resulting in 31.5% and 62% (p<0.001) patients with at least one medication error in the intervention arm and the control arm, respectively. With the introduction of quality-controlled (QC) discharge information, the number of patients with at least one medication error was reduced from 36.5% to 26.9% (p=0.278; RR=0.737) in a study performed at Landskrona Hospital with 115 patients (I:52; C:63).25 We used this reduction in relative risk to adjust the probability of at least one prescription error with QC discharge information. In a second study, primary care physicians and municipality care nurses were asked how much time they spend checking correctness of a patient's medication list when they were discharged from hospital to municipality care.27 The survey was based on two scenarios with and without an LIMM-discharge information. The average time allocated by a municipality care nurse was estimated to 59 min for patients discharged without a medication report.27 For those patients discharged with a medication report, the average time for a nurse was 26 min when inconsistencies between previous medication and the mediation report was found (89%) and 3 min when no inconsistencies were found (11%) (table 1). In the event the primary care physician had to be contacted to correct inconsistencies, (s)he would have to devote a certain time to review the medication list and perhaps contact the discharging physician at the hospital clinic. It was estimated that primary physicians spent on average 14.8 min for reviewing the medication list and 4.9 min if the discharging physician at the hospital clinic had to be contacted.27 The corresponding time in the intervention group was estimated to be 4.7and 2.3 min, respectively. Costs for hospital re-admissions in Part 1 were collected from the hospital accounting database, but revealed no statistically significant difference in means between the study arms (table 1). The same hospitalisation cost was applied in both the Admission and Discharge parts. The physician's, pharmacist's and nurse's time were costed at €0.87, €0.52 and €0.43/min, respectively, including payroll-taxes (42%) and overhead costs (25%). Intervention costs include both pharmacist's and physician's time for review, communication, prescription, training and quality checks. As we did not have information on the variability in nurse costs, we assumed the SD to be 42% of the mean, which was the average coefficient of variation for the other cost items in Part 2. Utility decrements, in terms of QALY due to rehospitalisations in parts 1 and 2, were taken from the literature and a weighted mean was calculated for the main rehospitalisation diagnoses from Part 1 (atrial fibrillation, hypoglycaemia, chronic obstructive pulmonary disease, hip fracture, heart failure).28–32 For patients experiencing a medication-related healthcare contact, we assumed a disutility decrement of 0.0014 QALY for a telephone contact, corresponding to approximately 2.5 days with moderate pain or discomfort according to the UK EQ-5D tariff.33 For a primary care visit, we assumed a decrement of 0.0028. Every analysis was performed with 10 000 iterations. Costs (Euro) and effects (QALY) are presented as means and SEs for both the standard procedure and the intervention arms. We also present scatterplots with all 10 000 iterations in the cost-effectiveness plane from the PSA, that is, the incremental cost (y-axis) is paired with the incremental effect (x-axis) from each iteration. In addition, cost-effectiveness acceptability curves were calculated for different willingness to pay thresholds.34 These present the probability that the additional cost of the intervention per QALY gained, compared with routine procedure, is less than the chosen willingness to pay. However, owing to space restrictions, they were not presented graphically. The first part of the model, that is, the systematic medication reconciliation and review process at initial hospital admission (Admission part), estimated the total cost for the intervention arm to €260 including the cost for pharmacist time of €34 (table 2). This was €273 lower than in the non-intervention group, which, together with 0.004 QALYs gained, indicated that the medication reconciliation and review process was a dominant alternative, that is, both cost saving and producing more health. As this intervention mainly affected the probability of unplanned rehospitalisations and outpatient visits, almost all cost savings arose in this cost item (€262). The drug review cost in the Standard Care arm (€46) was mainly a result of more costly physician time devoted to medication reconciliation upon discharge. The second part analysed the quality-controlled medication report at discharge from hospital (Discharge part). Also this intervention was dominant as it generated cost savings of €66 and improving health, although only marginally (0.001 QALYs gained). The intervention cost was lower as the time allocated for training in medication reporting and quality control was much shorter than in the Admission part. The savings in terms of avoided rehospitalisations and outpatient visits (€48) was lower than in the Admission part as a result of the lower probabilities for these events to occur. The cost savings for ‘Primary care nurse/physician administration cost’ (€23) was mainly driven by the time the outpatient nurse had to devote to review and update the medical list for the patient at the community level. In total, the integrated process could be expected to generate savings of €340, in spite of an intervention cost of €39, and gained utility of 0.005. The main savings accrued from the systematic medication reconciliation and review process at initial hospital admission (Admission part) owing to the reduced probability of unplanned rehospitalisations. Hence, because of the cost saving and the increased utility, the probability that the intervention would be cost-effective at a zero willingness to pay for a QALY gain would be 98%. This means that the intervention is expected to be cost-saving at a 98% chance in spite of the underlying uncertainty in the parameter values. However, as some observations from the PSA were found in the north-west quadrant (figure 2), where the intervention was more costly and resulted in a worse outcome, the probability that the intervention would be 100% cost effective was not possible. Scatterplot in the cost effectiveness plane for the Lund Integrated Medicines Management process. The sensitivity analysis indicated that the results were robust to several changes (table 3). As we ran probabilistic sensitivity analysis costs and effects in both the intervention and the control, arms can change relative to the base case scenario. These differences from the base case were therefore due to probabilistic differences. If no quality control of the medication list at discharge was performed, the potential cost savings increased marginally. As these medication errors did not result in any substantial medical care contacts, the reduced intervention cost for quality control (€4.9) was greater than the expected increase in medical list review cost for nurse and/or physician due to medication errors (€0.56). As we only accounted for any disutility in connection to medical care, the quality control did not affect the resulting utilities. As the main cost off-set was seen in avoided hospitalisation, we would expect the results to be sensitive to changes in this cost. When this cost was reduced to 50% for both treatment alternatives, the net cost savings almost halved (€185). In the base case, we used a cost per hospitalisation that was equal in both arms due to small number of observations. When costs were split in separate costs for patients in the control arm (€3620) and the intervention arm (€4925), or 36% higher, the scope for cost savings fell to €228. Likewise, when the probability of hospitalisation in the Admission part was doubled, the potential savings fell to €135, or by 60%. In addition, as a consequence of the increased probability in hospitalisation, the resulting utility gain was reduced. Increasing the intervention time by 50%, that is, the time for pharmacists in the reconciliation at hospital admission and quality control of medication lists at discharge, reduced the potential savings marginally to €320. Reducing the labour cost, that is, the time physicians and nurses spent on reviewing medication lists by 50%, had of course a greater consequence in the control arm as the time they devoted for this task was greater than in the intervention arm. Still, the results had only a very small impact on the cost savings compared to the base case (−11%). Combining the medication reconciliation and review process at initial hospital admission (Admission part) with a quality-controlled medication report at discharge from hospital (Discharge part) was shown to generate both cost savings and higher utility to the patients. In fact, investing €39 in clinical pharmacist time could save €340 in medical care at hospital and in primary care, as well as in administrative costs for correcting errors in medication lists in primary and municipality care after discharge. Furthermore, the analysis showed that the potential for cost off-set was greatest for systematic medication reconciliation and review process at initial hospital admission due to avoided costly hospitalisations. The main data sources supporting the probabilities for unplanned rehospitalisations, outpatient visits and prescription errors were based on two studies.6 ,21 One of the studies was a controlled pre–post study and the outcome was assessed blind.6 In a recent systematic review of hospital-based medication reconciliation practice, this study was evaluated as a non-controlled pre–post study and was consequently erroneous evaluated as being of poor quality.35 However, it must be stated that some of the reported resource utilisation (costs) did not show statistically significant differences between the treatment arms for example, the hospitalisation cost. Small patient samples and great variability in the studied variable is often the reason for this. All bias and confounders could not be ruled out since the studies were not randomised and controlled for. However, in our opinion patient-based randomisation could be problematic in team-based interventions. There is of course a risk of bias due to carry over effects decreasing the difference between groups. But there is also a risk of bias increasing the difference between groups owing to a decreased level of care in the control group than before introducing the intervention. There is a need for higher attention and further studies in this field. The time utilisation in primary and municipality care for calculating administrative costs for error corrections was also based on surveys.27 In addition, utilities were taken from the literature and may not entirely reflect the analysed patient population. This are, of course, weaknesses in this study, but nevertheless, the resulting cost savings were shown to be stable in spite of several sensitivity analyses which indicated that these shortcomings may be of less importance. Hence, discarding the assumed utilities, the model would still be valid for a cost-minimisation analysis. As previously described, several studies present positive economic benefits from clinical pharmacy services study.15 Bojke et al performed a health economic analysis on the RESPECT trial (Randomised Evaluation of Shared Prescribing for Elderly people in the Community over Time) which included services similar to our study.15 The RESPCT trial measured both resource use and utility of the patients but did not attain statistically significant differences in outcomes. Their intervention was expected to cost an extra £192 per patient and year with a gain of 0.019 QALY, resulting in an incremental cost-utility ratio of approximately £10 000 (2004–2005 prices). Apart from differences in healthcare structures between the UK and Sweden, the discrepancy in results may be attributable to the fact that the RESPECT trial was a primary care-based pharmaceutical care intervention whereas the LIMM process was hospital based. A recent Swedish study providing similar services as in LIMM concluded that a hospital-based clinical pharmacist was not cost effective according to the Swedish willingness to pay for a gained QALY.16 In fact, the cost in the intervention arm tended to be higher than in the control arm, and with only marginal QALY-gains. The authors discuss some potential reasons for this outcome, eg, the use of inexperienced pharmacists. In the LIMM model, the pharmacists were fully integrated in the care team and worked very structured and systematic. The difference between the studies’ results could therefore describe a learning curve and or the benefit of a trustful care team supporting the patient. Furthermore, our cost analysis included only hospitalisations that were considered drug-related during a 3-month period after discharge whereas Wallerstedt et al included all hospitalisations during 6 months. When including probabilities only for drug-related hospitalisations, we avoided hospitalisations due to differences in patient characteristics and comorbidities between the study arms. Still, historical controls’ medical records were scrutinised to identify ‘certain’, ‘probable’ or ‘possible’ hospital readmissions, which may introduce bias from either too strict or too loose rules for causality. Hence, the size of the gains may not be permanent. In addition, one could argue that the cost effectiveness may be reduced as more and more medication lists will eventually have been reviewed. However, the errors analysed in the LIMM model are often generated during the hospital stay why we believe this process is important to improve the care given and to save resources even in the future. Furthermore, the elderly part of the Swedish population will increase and, hence, the disease burden. Thus, the scope for cost-savings may change with the development of the healthcare structure and internal organisations, why further research is warranted. The results from this study can be used for allocating resources where the expected outcome is the most favourable. However, it is important that the gains may not be limited to financial resources and utility for the patients. Some physical resources may be in scarcity, such as physicians or nurses, why it may be important to also consider potential bottlenecks in the healthcare process. If, for example, there are a limited number of hospital beds at a ward, it may be recommended to invest in a process reducing the hospitalisations due to medication errors. This could free resources to other patients and probably reduce the distress of the personnel at the ward. In the same way, the time devoted by nurses at nursing homes and physicians reviewing medication lists after hospital discharge can be spent on other tasks. Rescaling our results to a situation where we have approximately 150 000 hospital admissions in the Southern healthcare region with similar patient characteristics as modelled here, this would mean that some €51 million could be saved per year if the LIMM process was rolled out in the entire region. As it is today, the physician is already, by law, supposed to provide medication discharge information, but this is poorly complied with.15 Maybe a pay-for-performance could provide a good incentive to get the physicians to provide a quality-controlled medication report at discharge. The LIMM medication reconciliation (at admission and discharge) and medication review was both cost saving and generated greater utility compared to standard care among elderly patients, foremost due to avoided drug-related hospital readmissions. As the number of elderly increase in most western countries, the scope for saving resources within the healthcare sector can therefore be rather substantial. However, when implementing such a review process with a multidisciplinary team, it may be important to consider a structured use of check-lists, as well as a learning curve, in order to capture the full advantage. Institute for Healthcare Improvement. Prevent adverse drug event with medication reconciliation. In: http://www.ihi.org/explore/ADEsMedicationReconciliation/Pages/default.aspx (accessed 6 Jan 2013).
. Incidence of adverse drug reactions in hospitalized patients: a meta-analysis of prospective studies (see comments). JAMA 1998;279:1200–5.
. The health care cost of drug-related morbidity and mortality in nursing facilities. Arch Intern Med 1997;157:2089–96.
. Hospitalisations caused by adverse drug reactions (ADR): a meta-analysis of observational studies. Pharm World Sci 2002;24:46–54.
. Outcomes of emergency department patients presenting with adverse drug events. Ann Emerg Med 2011;58:270–9.
. Impact of the Lund Integrated Medicines Management (LIMM) model on medication appropriateness and drug-related hospital revisits. Eur J Clin Pharmacol 2011;67:741–52.
. A Comprehensive pharmacist intervention to reduce morbidity in patients 80 years or older a randomized controlled trial. Arch Intern Med 2009;169:894–900.
. Effects of a clinical pharmacist service on health-related quality of life and prescribing of drugs: a randomised controlled trial. BMJ Qual Saf 2011;20:738–46.
. An innovative approach to integrated medicines management. J Eval Clin Pract 2007;13:781–8.
. Economic effects of clinical pharmacy interventions: a literature review. Am J Health Syst Pharm 2008;65:1161–72.
. Economic effects of pharmacists on health outcomes in the United States: a systematic review. Am J Health Syst Pharm 2010;67:1624–34.
. ACCP: economic evaluations of clinical pharmacy services: 2001–2005. Pharmacotherapy 2009;29:128.
. Clinical pharmacy services and hospital mortality rates. Pharmacotherapy 1999;19:556–64.
. Model-based cost-effectiveness analysis of interventions aimed at preventing medication error at hospital admission (medicines reconciliation). J Eval Clin Pract 2009;15:299–306. RESPECT Trial Team. Cost-effectiveness of shared pharmaceutical care for older patients: RESPECT trial findings. Br J Gen Pract 2010;60:e20–7.
. A cost-effectiveness analysis of an in-hospital clinical pharmacist service. BMJ Open 2012; 2:e000329.
. A multi-intervention approach on drug therapy can lead to a more appropriate drug use in the elderly. LIMM-Landskrona Integrated Medicines Management. J Eval Clin Pract 2009;15:660–7.
. A structured questionnaire to assess patient compliance and beliefs about medicines taking into account the ordered categorical structure of data. J Eval Clin Pract 2009;15:713–23.
. In-hospital medication reviews reduce unidentified drug-related problems. Eur J Clin Pharmacol 2012 Sep 7. [Epub ahead of print].
. The process of identifying, solving and preventing drug related problems in the LIMM-study. Int J Clin Pharm 2011;33:1010–18.
. Medication report reduces number of medication errors when elderly patients are discharged from hospital. Pharm World Sci 2008;30:92–8.
. Improved quality in the hospital discharge summary reduces medication errors-LIMM: Landskrona Integrated Medicines Management. Eur J Clin Pharmacol 2009;65:1037–46.
. The effect of medication reconciliation in elderly patients at hospital discharge. Int J Clin Pharm 2012;34:113–19.
. Errors in medication history at hospital admission: prevalence and predicting factors. BMC Clin Pharmacol 2012;12:9.
. Clinical outcomes from the use of Medication Report when elderly patients are discharged from hospital. Pharm. World Sci 2008;30:840–5.
. Experiences from the implementation of structured patient discharge information for safe medication reconciliation at a Swedish university hospital. Eur J Hosp Pharm Sci Pract 2011;17:42–9.
. The hospital LIMM-based clinical pharmacy service improves the quality of the patient medication process and saves time. Eur J Hosp Pharm Sci Pract 2012;19:375–7.
. Changing preferences for survival after hospitalization with advanced heart failure. J Am Coll Cardiol 2008;52:1702–8.
. An updated systematic review of Health State Utility Values for osteoporosis related conditions. Osteoporos Int 2009;20:853–68.
. Is the EQ-5D responsive to recovery from a moderate COPD exacerbation? Respir Med 2011;105:1195–202.
. Systematic review and cost-effectiveness evaluation of ‘pill-in-the-pocket’ strategy for paroxysmal atrial fibrillation compared to episodic in-hospital treatment or continuous antiarrhythmic drug therapy. Health Technol Assess 2010;14:iii–iv, 1–75.
. Cost-effectiveness of insulin detemir compared to NPH insulin for type 1 and type 2 diabetes mellitus in the Canadian payer setting: modeling analysis. Curr Med Res Opin 2009;25:1273–84.
. Modeling valuations for EuroQol health states. Med Care 1997;35:1095–108.
. Cost-effectiveness acceptability curves—facts, fallacies and frequently asked questions. Health Econ 2004;13:405–15.
. Hospital-based medication reconciliation practices: a systematic review. Arch Intern Med 2012;172:1057–69. Contributors TE and ÅB are the lead investigators for the LIMM model, have full access to data from the studies included in the analyses and conceived the idea of the study. OG and UP were responsible for the design of the cost-utility model and OG was responsible for the data analysis and produced the tables and graphs. The initial draft of the manuscript was prepared by OG and TE. All authors assisted in planning the study, developing an analysis plans, interpreting data and critically revise drafts of the manuscript. Funding This study was funded by Apoteket Farmaci AB. Competing interests TE was previously head of research and development at Apoteket Farmaci AB. This company is a state-owned pharmacy company which had commercial interest in disseminating the LIMM-model.